23 Inch Guitar for Kids, Basswood Mini Guitar Kids Musical Instrument Toy for Beginner(Black) by Dilwe at Way North of Nashville. MPN: Dilwenrmt0gdxcs-03. Hurry! Limited time offer. Offer valid only while supplies last. Features: 1. CULTIVATE MUSIC INTEREST: As a musical toy it can cultivate kids' music interest, train their auditory and creativity ability. 2. 1. CULTIVATE MUSIC INTEREST: As a musical toy it can cultivate kids' music interest, train their auditory and creativity ability. 2. 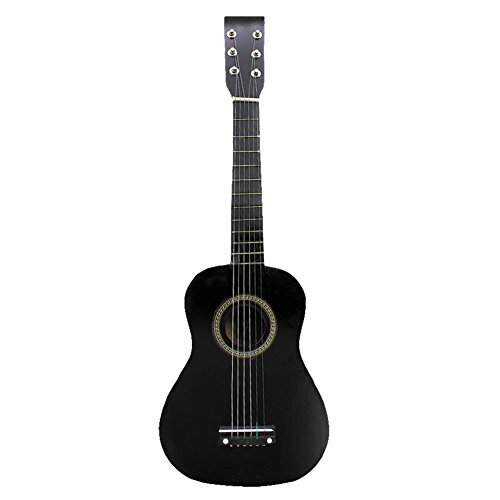 LIGHTWEIGHT&PORTABLE: This guitar is 23 inch mini size, lightweight and portable for kids to play. 2. COLORFUL SURFACE: Kids always like bright-colored toys. These guitar are designed with colorful surface, attractive to children. 3. FINE WORKMANSHIP: With fine workmanship to ensure safety for children to play with. CULTIVATE MUSIC INTEREST: As a musical toy it can cultivate kids' music interest, train their auditory and creativity ability. LIGHTWEIGHT&PORTABLE: This guitar is 23 inch mini size, lightweight and portable for kids to play. COLORFUL SURFACE: Kids always like bright-colored toys. These guitar are designed with colorful surface, attractive to children. FINE WORKMANSHIP: With fine workmanship to ensure safety for children to play with.